Inter-office romance isn't always a match made in heaven. However, the cyber stars did align for Allana and Ryan in 2011 when these two UX designers met via a chance encounter at work. At the time, Allana was finishing her internship with Amazon when she introduced herself to Ryan, a designer within the Amazon Video Games division, as she hoped to pick his mind about how to potentially interview for a job. The conversation ignited a spark between the two Amazonians and soon thereafter, Ryan and Allana began a courtship with The Spheres as its backdrop. 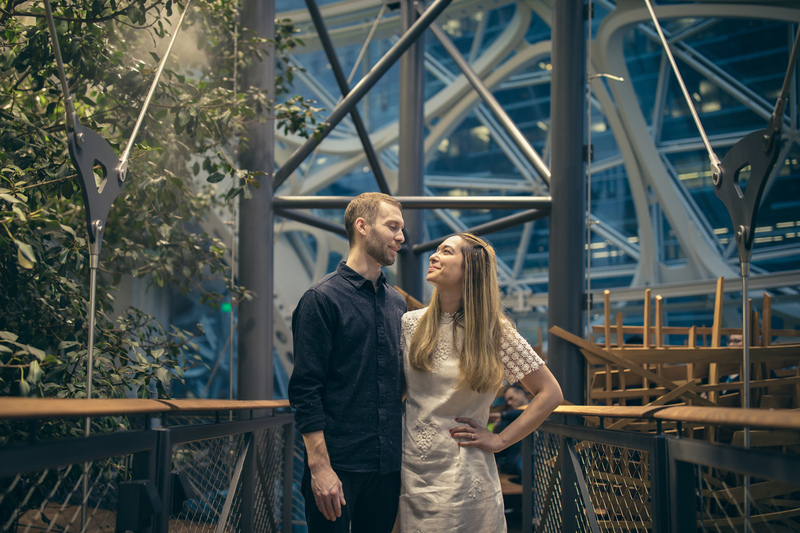 Fast-forward 5 years and Allana and Ryan are both still working for Amazon as retail experience designers and their interoffice romance has since bloomed into a long-lasting relationship. A few months ago, Ryan proposed in the Meiji Shrine park in Tokyo, among the lush trees and enormous shrines. Read all about the details of Allana and Ryan's Amazonian engagement here.